Properties in Keaau average 4.6 out of 5 stars. Property 1: Tropical Paradise On a Budget! Property 2: Rain Forest Apartment! Property 5: Tropical Studio Apartment! Property 11: Keaau Apartment on Beautiful Acre w/ Pool & Deck! Property 16: Lava Apartment in Paradise! 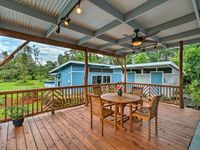 Property 19: Oceanview Hilo Studio w/ Elevated Covered Deck! Cindy (the owner) is so helpful! She responds quickly to questions. She is gracious and very knowledgeable. She even took time from her schedule to give us an interesting and unique tour of the the area, including taking us to where the 2018 lava flow destroyed many of the homes and created a new black sand beach (see Isaac Hale Beach Park and Pohoiki Black Sand Beach). We felt like she gave us a realistic insider's perspective to the area. 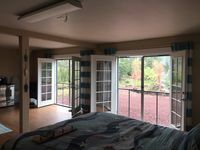 Cindy's home is relaxed and comfortable, secluded and quiet. It had everything we needed for our short stay. We wish we could have stayed longer in this home close to the ocean. We jogged while there and felt safe doing so. Her home worked fine for our family of 4 with 2 older kids. Since it is rather secluded, you will need a rental car to get around.